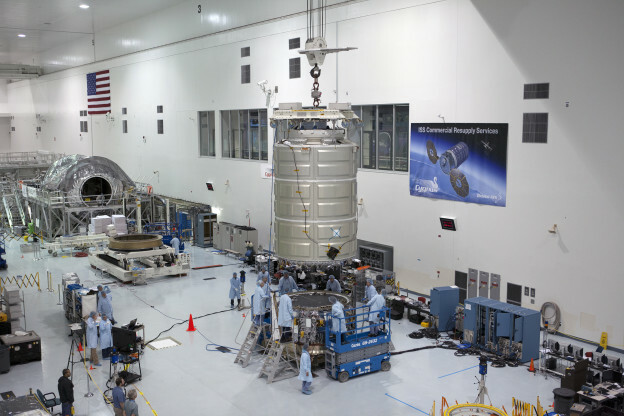 Engineers completed connecting the Pressurized Cargo Module with the Service Module to form the Cygnus spacecraft that will ferry more than 7,000 pounds of supplies, equipment and experiments to the International Space Station during its December mission. Working inside the Space Station Processing Facility at NASA’s Kennedy Space Center in Florida, crews lifted the cargo module off its work stand and lowered it precisely onto the service module before completing the connections of fasteners and systems. The service module contains the power-producing solar arrays, propulsion system and instrumentation to steer the spacecraft once it reaches orbit. Not carrying any crew, the Cygnus will fly autonomously to the station where astronauts there will use the robotic arm to latch onto the spacecraft and berth it to a port for unloading. A United Launch Alliance Atlas V will lift the Cygnus into space from Space Launch Complex 41.